I wanna shoot you with my Love Gun. You are on KISS' official site..www.kissonline.com . 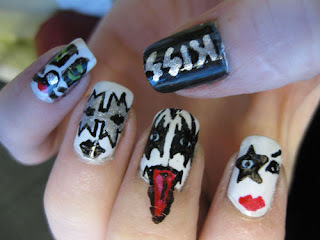 ha we had rock day today at school (we have homecoming week as themes every year and you have to dress up and stuff) and i actually googled rock themed nails earlier today and found this and did it on my own nails. :) i was actually looking for country nails now for tomorrow when i came across your website (and just to let you know i have spent the last hour on here :P ) and i didnt even know this is where the image came from til i found it again on here! this was an awesome design by the way i love it and will definitly be doing it again. :) love your stuff keep it up! nice post thanks ! !Superb design work i love this great post and i want to share it with my friends. Thanks for sharing such an interesting post with us. You have made some valuable points which are very useful for all readers.